Come by the library to watch the movie Coco, eat treats and scrutinize student altars on Nov. 1 and 2. On the week of Oct. 22 students brought pictures of deceased family and pets for the library altar. 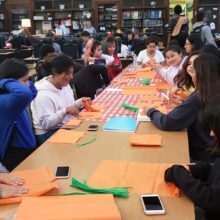 On Oct. 25, the library welcomed students to learn how to make paper marigolds with members of the Latino Student Union. Dia de los Muertos (Day of the Dead) is a Mexican tradition celebrated on Oct. 31 through Nov. 2. This Mexican holiday is to articulate one’s death by placing altars; Flor de Cempasuchil (marigold flower), candles, pan de muerto (bread of the dead), photos of loved one’s, the favorite food of loved ones and and sugar skulls. On Nov. 1, deceased children visit their family. On Nov. 2, deceased adults reunite with their family. If you have watched the movie “Coco” you may know what I am talking about. The tradition continues to take place at a cemetary where a loved one is buried. Families bring their loved one’s a whole picnic, listen to music with their loved ones or spend the night with their loved ones to celebrate a life that was once lived. Dia de los Muertos has been around since the 16th century during the time of the Aztecs. This holiday tradition is not a Mexican version of Halloween, whereas Halloween is meant for terror. On the other hand, Dia de los Muertos is demonstrated to articulate love and respect for loved ones who are deceased. Enjoyed reading your story that celebrates this honorable tradition to celebrate and remember our loved ones lives.